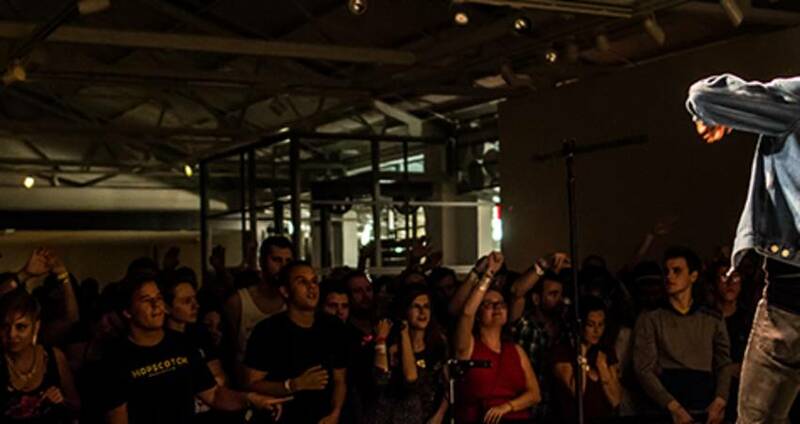 Get to know the downtown Raleigh, N.C., music venues set to host Hopscotch Music Festival, "one of the best and most eclectic music festivals in America," according to SPIN. Get the scoop on the dozen venues below, plus some tips to help along the way. 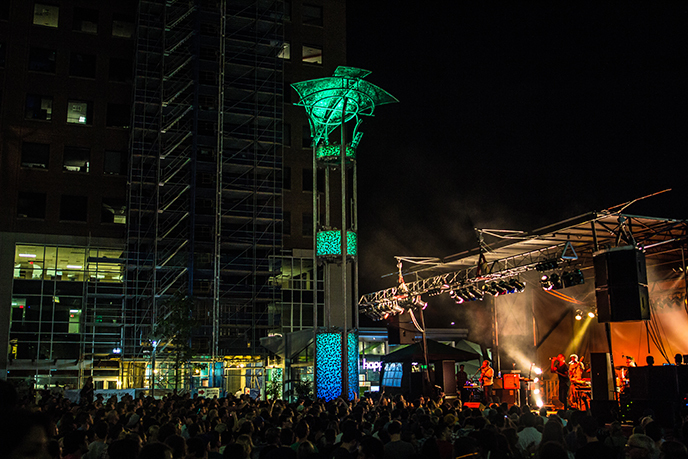 Located in the heart of the center city, the artful City Plaza, with 50-foot programmed light towers and sculptures from N.C.-based artists, is one of the premier and most popular spots for outdoor live music events in Raleigh. Experience Wolf Parade, Beach House, Sylvan Esso and more here. Memorable Hopscotch moment in City Plaza: Wayne Coyne of The Flaming Lips shooting lasers out of a pair of giant hands all the way down Fayetteville St. to the North Carolina State Capitol. Located near a bevy of great dining spots. After relocating to Martin St. in 2010 following a three-year absence from the music scene, this local-favorite venue has once again become a prime location to catch independent bands on the rise. Located above Neptunes Parlour, you can grab a delicious cocktail and dig into the venue’s arcade game collection. Fuel up with food at Garland, also downstairs from KINGS, serving up spice-driven seasonal cuisine with a focus on Indian and Asian flavors. 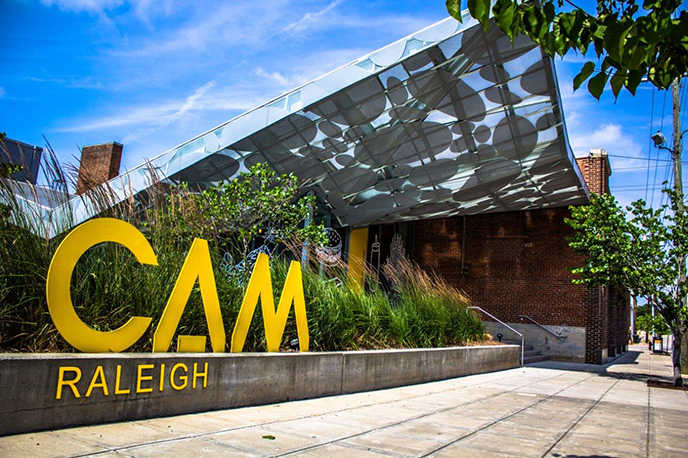 Headed up by passionate mind and executive director Gab Smith, CAM Raleigh (pictured in header and below) features an ever-changing collection of contemporary art and strives to inspire visitors with captivating works from some of the top artists today. The museum, in a re-purposed early 20th century produce warehouse, honors the spirit of the former tenant by keeping fresh works moving in and out, showing visitors what’s current in the art world. Situated in the Warehouse District, chow down on delicious eats at spots such as The Fiction Kitchen and The Pit, before or after performances. Plus you get a chance to grab a brew on your way at nearby Crank Arm Brewing. A new venue for Hopscotch this year, Nash Hall promises a vibe similar to that of CAM Raleigh&apos;s, with even more of an up-close-and-personal feel. Formally Nash Motors from 1929-1956, the building has tons of history and personality. The design and atmosphere of the venue is a perfect match for the artists set to perform, including Julien Baker, William Basinski, Adia Victoria and others who will take the stage. Experiencing Deep South when you come to Raleigh for live music is a must. With lyrics covering the interior walls of the venue, look for the words from some of your favorite songs. Thirsty? Deep South offers crazy-good local beers. Plus, catch some fresh air between performances on the venue&apos;s outdoor patio and take in an iconic view of the Raleigh Convention Center&apos;s CREE Shimmer Wall. The theater offers up 600 seats, with the farthest balcony seat (yes, balcony seating for an "overhead" view of the stage) 70 feet from the stage. You won&apos;t want to miss Quilt, Maiden Radio and Joan Shelley. Located on the east side of the Duke Energy Center for the Performing Arts, the walk to the venue makes for great #visitRaleigh photo/Instagram opps. This former movie theater is home to one of the best sound and lighting systems in the area. 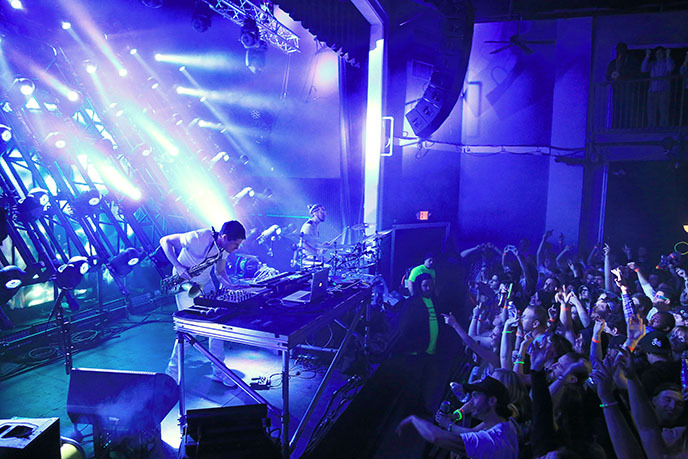 Music fans can fill the dance floor and practically reach the artists from stage-side, or watch from a variety of levels for multiple views. The Thurs. lineup for Hopscotch is a great chance for metal fans to catch Converge, VHÖL and Mutoid Man in a single night, and Sat. features rock acts All Dogs and Soldiers of Fortune. Don&apos;t forget to peak your head around the corner of the building before or after a show to catch a glimpse of Honest Abe driving a Lincoln in a wall-covering piece of art. You may feel a bit like Harry Potter skulking around Knockturn Alley the first time you walk down the narrow alley and through the door of this Moore Square institution. Open nearly 365 days a year, The Pour House Music Hall plays host to bands of all genres, from bluegrass to metal and reggae year-round. But the place isn’t called The Pour House Music Hall for nothing. The venue is known for its well-stocked bar and variety of quality beers on tap, so go thirsty. 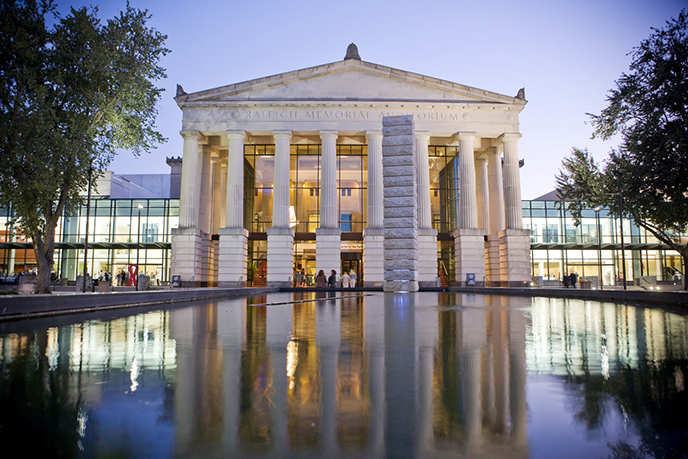 Opened in 1932, and renovated in 2014, Memorial Auditorium is the crown jewel of N.C. performing arts. Over the years, this richly-historic theater has played host to a dazzling spectrum of artists and performances. Just a sample of the list quickly becomes dizzying: Sinatra, Gillespie, Baryshnikov, Tony Bennett, Ray Charles, Sarah Vaughn, Itzhak Perlman, Natalie Cole and Prince. Artists to catch here during Hopscotch include Television, Young Thug, Boulevards and Andrew Bird. A subterranean bar featuring a selection of fine draft beers from small brewers in N.C. (and a couple from elsewhere) and well-made cocktails with a focus on fresh ingredients and flavors. The drink specials change with the weather, using local ingredients when they&apos;re at their best in delicious, fun and affordable libations. Come for the music, stay for the drinks and the super-eclectic crowd that gathers at the bar and on the dance floor. And as mentioned above, also catch that arcade game collection! 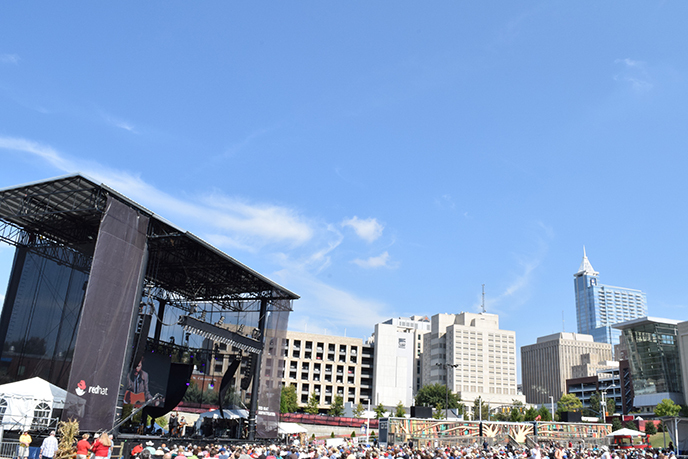 Since opening in 2010, Red Hat Amphitheater has become a beacon for live entertainment in the Southeast. Just steps from the fun and energy of downtown Raleigh&apos;s bars, clubs, galleries and restaurants, this 6,000-seat venue offers up a concert setting with the CREE Shimmer Wall as a backdrop. You can&apos;t miss Erykah Badu and Gary Clark Jr. here Friday night. 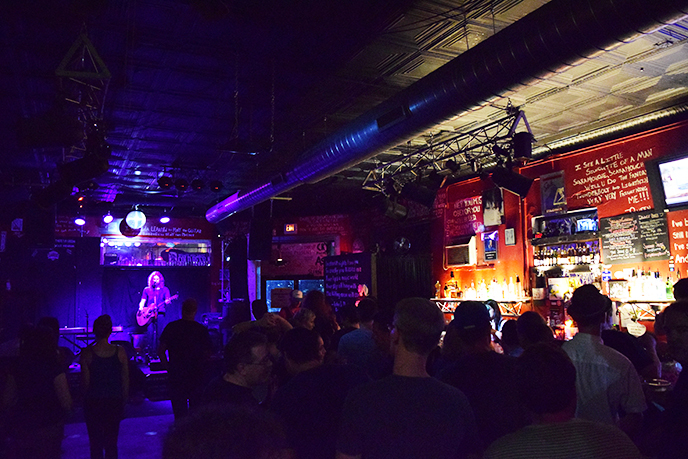 Slim’s may be your quintessential hole-in-the wall venue. Blink as you’re walking past its downtown Raleigh storefront and you might miss it. Inside you’ll find one of the area’s more shoulder-to-shoulder venues as patrons crowd the narrow stage and line the stairway to get a better view. Check out the small lounge with a pool table upstairs to get a game in (you might have to get in line). Must be 21+ to enter.